I am a private school librarian. There is a tendency to think that those who attend private school are wealthy and elite. However, I have seen a very different picture in my current school. We charge tuition, but we also raise money to cover the financial aid needs of students otherwise unable to attend. With forty-six percent of our students receiving financial aid, there is a great deal more socioeconomic diversity at my private school than at many public schools. Many of my students’ parents are making sacrifices for what they consider an investment in a high-quality education. I want to deliver service worthy of the investment they are making. And in my mind, a high-quality education always includes a school library and a school librarian. Educators of all types are watching for what is on the horizon for the future of K-12 education under the new White House Administration. Though policies and budgets are not yet certain, there have been hints about vouchers, school choice, and charter schools. Though national education policies have made gains in the past 10-15 years, many factors that influence education are actually determined at the state level. Information from The National Alliance for Public Charter Schools indicates the charter school movement is on the rise. Using NAPCS data, I have analyzed the movement in my home state of Tennessee, and you will see from the chart that there is significant growth over a ten-year period. There were four charter schools in 2004 and 80 charter schools in 2014. 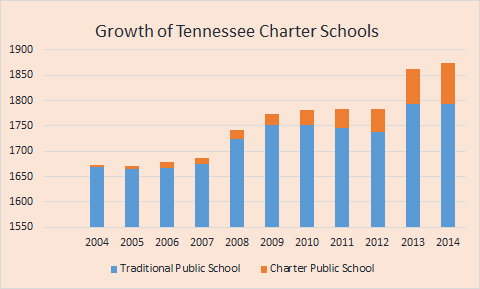 Charter schools enrolled more than 22,500 Tennessee students in 2014. Whereas, it does not appear that Tennessee has an education voucher program. The only “school choice” benefit offered currently in Tennessee is the education savings account (ESA) program. There are only a handful of voucher programs in the US. After analyzing data from Ed School Choice, it appears that Maine, Vermont, Ohio, and Wisconsin seem to be leading the way in voucher programs. 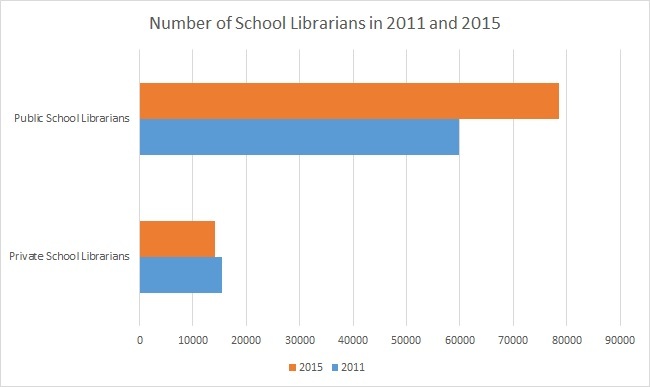 According to data obtained from the ALA fact sheet and using archived pages, there is an increase of more than 19,000 librarians in US public schools between 2011 and 2015. In that same time frame, there is a decrease of 1,400 librarians in private schools. As a private school librarian, this decline is concerning. Of course, the first questions I ask is “Are there fewer schools?” and “Is enrollment declining?” The number of schools is not significantly fewer and there is some decline in enrollment, but neither number seems to explain the loss of these librarians. I have not been able to research the cause further, but I suspect budget cuts are the primary reason for the missing school librarians. College and university libraries are experiencing similar struggles in recent years. When looking at the public school numbers from the National Center for Education Statistics “During the 2011–12 school year, 79,000 of the 85,500 traditional public schools in the United States reported having a library media center, while 2,200 of the 4,500 public charter schools reported having one.” So, less than half of charter schools in 2011–12 school year had a school library, and I am afraid that even fewer had a school librarian. At the end of the day, it is sad that a number of private and charter school systems do not see the value of a school library. The defense is sometimes blatant with statements about libraries and librarians being obsolete. Yet, some schools are making tough calls between salaries of librarians and salaries of other essential teachers. AASL members fought to include language supporting school librarians in the Every Student Succeeds Act (ESSA). Last year I wrote about why it is important for private school librarians to advocate for the ESSA. However, we must also ask what is behind the missing librarians in the private and charter schools. Do those funding innovative education solutions for charter schools see the value of a school library and librarian? Do those parents who sacrifice time and money to send their kids to private schools value school librarians? If not, then we have work to do! And by “we” I mean every type of librarian including public and academic librarians, private, public and charter school librarians, all working together to advance the essential work and profession of librarianship. I was very surprised by your data. The public schools in Los Angeles, California generally do not have qualified librarians, but the independent schools in the area do have librarians with an MLS degree or certification. Curious. This was a very interesting read for me. I recently worked as a LMS at a Classical charter school. My school was a BCSI school; one of sixteen but only one other of those schools have a library. My daughter will be attending a private school next year (we moved over the summer) and they do not have a library. We are staying with classical education and it seems that if you have a school that prides itself on teaching classical literature then you should have a school library program to further that education and love of reading. I asked the principal at the new school why they don’t have a LMC and she stated funding was the reason. This is also what I was told when I was at the charter school. My headmaster had to find a grant and include test coordinator duties to get the LMS position approved for me last year. It’s sad that even with the research we have showing the positive correlation between a library media program and student achievement that more importance isn’t put on funding a LMC in every school. I would guess that at least some of this reduction is due to private schools closing entirely, having less funds, or not being able to attract a candidate to the position due to factors such as location and salary. In the Chicago area, we have seen the closure of both private (primarily Catholic) and public schools and the proliferation of charters. Charters don’t seem to value school libraries. I doubt many are planned or designed to have a school library. I check the job listings often and they advertise for marketing positions in addition to teachers. I would love to know where these public schools that are adding librarians are located.